Sorry for not writing earlier. I have been anxiously trying to arrange some conclusive plan for our men from south to return to Mayapur and complete the samadhi work. I wanted to write you once those plans were more clear. However, we have, unfortunately, run into some difficulties while making arrangments. First off, when we had all the men and new pieces ready for transport to Mayapur, some of the workers met with a serious bus accident while on their way to catch the train to Mayapur. 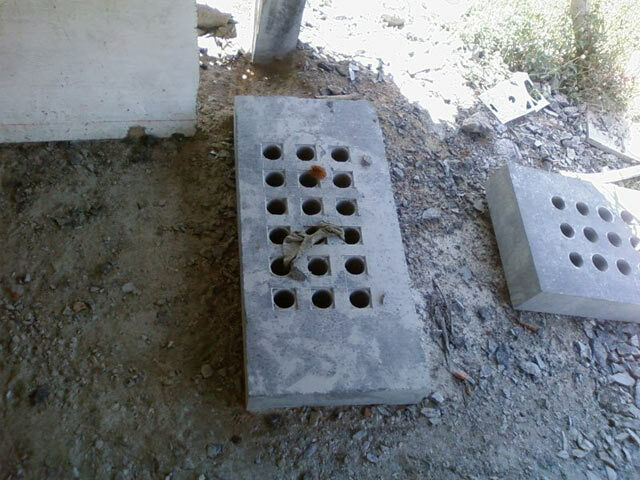 This accident claimed one of the worker’s life and the others were badly injured. Those workers are now in Chennai, recovering from the accident and trying to obtain insurance conpensation money for their injuries and loss of life. There is an ongoing courtcase to settle the amounts to be paid and to whom. Considering the indian legal system’s lack of haste and concern in these matters, it could take quite a while for the men to get their money and come to Mayapur. In the meantime, I have tried other avenues to get our work completed. I have aked our head of the team (he was fortunately not involved in the accident) to search for a new team of workers. He has done so but, has also had difficulty in finding realiable, reasonably priced and interested workers to do our work. One team of men was ready to come to Mayapur right away but, was demanding more than double the wage and a lot of advance money. When our man tried to negotiate the price and demanded that he would not pay so much then, the group lost interest and ignores our attempts to contact them. There was another group that agreed to come but, only after 2 months, since they are now busy with a large project combining the use of hundreds of carvers and workers. And although there are plenty of stone carvers and workers, I must explain that there are of many catagories. For instance, you have your carvers who specialize only in deity carving. There are also the ones who only do architectural sculpting and others who make stone utensils like grinding mortars, stone slabs, etc. So, the workers we need should specialize in architectural work, not any of the other catagories. And these kind of workers are rare to find and usually in high demand by big Stapathis, who emply hundreds of them to build massive and highly expensive temples. The pay is regular and over a long extent. Sometimes they also get the chance to work abroad. So, the leftovers are what we have to chose from and that doesnt give us much to work with. Another important thing to keep in mind is that, even if we get a group of workers ready to come within our conditions, they should be skilled and experienced workers. We want to avoid any more mistakes and make sure the end result is pleasing to Maharaja and the other devotees. Possibilty of floods. I have heard many different opinions. Some say the floods will come in september, some say october and others say the flood wont come this year. Experience has shown that we cannot surely predict this. So, even if we get some men to come to mayapur soon, we do not want them to be caught in the middle of the flood, where they wont be able to work and it would be a loss for us, financially, to have to pay for them to not be working. I have given about 10 days time limit to bring the workers now. If this cannot happen, I think it would be safer for both parties, that the workers come after floods. This will give more time to keep looking for the best available workers and make all arrangements in advance. The other thing is that I will be leaving to south india on the 25th of this month. I will be staying down there for a couple of months. This trip I have been planning for almost a year. So, while I am in south, I will still be in touch with our man in Mahabalipuram about getting the workers together. And, if nessesary, on my way back to Mayapur, I will stop in Mahabalipuram to help coordinate the arrangements. So, the conclusion of all of this is that, all we can do now is keep trying. I feel that these difficulties are there to teach a little patience and humility. Krsna and Suhotra Maharaja must have their own plans. I will, however, not give up and will keep pushing untill completion. Krishna willing, this will be soon. I am still in touch with our head man and Shanti prabhu. We are all considering and persuing any possiblities. Whatever works best we will make the arrangements for. The architect in south has offerered to give back some of the Laksmi for the sake of leverage, if we demand so. Probably not necessary, since he is still fixed on finishing what he started. But, if the devotees will feel safer so, then we can calculate a figure to ask from him. 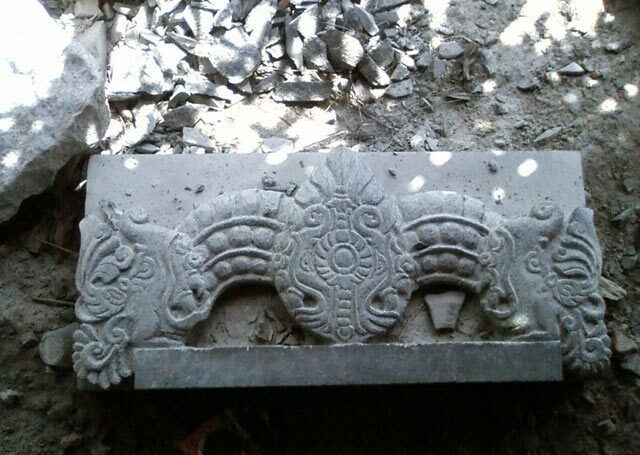 I have also attached pictures of the new pieces that were remade in Mahabalipuram. They are 3 window jalis and torana (sculptural panel above the door). In the picture they are incomplete but, the pictures are pretty old and I will receive new pics of them finished soon. Please let me know if you or the devotees have any queries. I request all the devotees to please pray for a successful and swift completion.